A slow start, but an epic second-half. Monday night has ended with a bang. West Brom defender Craig Dawson: "We build ourselves on clean sheets and to be two goals up and lose the game is very disappointing. We know Everton are a top team but we have to pull our socks up and learn from our mistakes. "To concede straight after scoring is disappointing and we have to learn from it." It seems the problem is that Jonny Evans is a number six, not a number five. Those were Tony Pulis's words when discussing his patched-up back four. Tony Pulis says that defender Jonas Olsson has a groin injury which is not looking good. He's not a happy man. There were 41 goals scored this weekend, the most in a Premier League weekend since 22-23 March 2014. West Brom boss Tony Pulis: "The first goal kills us. We should deal with it. Losing Gareth McAuley and Jonas Olsson to injury hasn't helped us any, playing against Romelu Lukaku. "The other two goals are poor goals - the second one looks offside, the linesman is looking the wrong side. It's a poor decision. "Really, really disappointing because before we scored the second goal we had some good chances. "We switched off and Everton will punish you." More from Everton manager Roberto Martinez: "To be able to break West Brom down you have to put a lot of things together. "The Merseyside derby is an incredible football occasion and we are ready for a special Goodison Park atmosphere. "John Stones and Seamus Coleman both wanted to play tonight, they are very close and I am positive that we will have two or three players back for the weekend." Tony Pulis has lost a Premier League game from a leading position of 2+ goals for the first time. Everton scored with three of their four shots on target, all four of which came in the second half. There was only one minute and 24 seconds between WBA’s second goal and Everton’s first. Everton manager Roberto Martinez: "We were very disappointed with the first half. We were off, every single individual. "The mountain we had to climb, it would have been easy to lose focus but we got three goals against the best defensive structure in the Premier League. "Every three points is huge but it feels extra good. Gerard Deulofeu took extra responsibility, he wanted the ball all night and it was a real mature performance. "The last game before the players go away always feels like a bit of a final and it's the derby so it's extra emotional for us." Everton go into the Merseyside derby on Sunday in fifth place, one point and four places above Liverpool. Everton skipper Phil Jagielka: "At 2-0 down there's always a way back, it was disastrous for us but we got back into it straight away. It could have gone either way but we are delighted. "The defence didn't have many Premier League games between them but this was a game for them to learn their trade!" Everton striker Romelu Lukaku: "The first half was not too good, and at half-time the manager woke us up. The experienced players spoke up! One goal was always going to bring us back into the game and at the end we won the game. "I knew the first goal was crucial. I knew that we could win the game." "Everton looked far more comfortable when they threw the shackles off and went for it. Going 2-0 down was the best thing that could happen to them!" It doesn't matter! Everton win after a stirring comeback. Someone, somewhere is having the night of his life, £45k up from a £5 stake. But Everton clear. And they are away! A four-on-one counter but they make a hash of it! Ross Barkley leads a counter-attack for Everton, James McCarthy has his own postcode of space on the right but blinkered Barkley ends up having a shot which is easily charged down. I couldn't wait for the first half to end, now I don't want this to finish. End-to-end. If West Brom get a corner you'd fancy them to score! I like to see this. Romelu Lukaku comes off and he gets a huge reception from all four sides - home and away fans. So close! Just as I read that somewhere, someone has got a £45k accumulator riding on an Everton win Rickie Lambert screws a shot inches wide for West Brom! A sensational comeback. Two goals and an assist for Romelu Lukaku. We said they had to get him in the game more and they certainly have done. West Brom's defending has not been clever. But what a second half. Can Albion fight back? Rickie Lambert is on. Isn't football brilliant?! Who saw this coming! Gerard Deulofeu makes it again with a great cross in, Romelu Lukaku is a human wrecking ball in the box, he beats two defenders to the cross, gets a bit of luck when the ball ricochets off his hand, and Lukaku is able to turn and fire in from two yards out. A mess for Albion. A beautiful mess for Everton. West Brom's gameplan is now based on hitting Saido Berahino over the top but Phil Jagielka is wise to it. What a fine second-half this has been. A stinker for the first 45, a blinder since. Everton's noisy fans believe they can win it, and maybe the players do too. Gerard Deulofeu - the wildcard - keeps on running at his man but again takes it too far. Everton have only come from two goals behind to win in the Premier League once before - and it was a key game against Wimbledon in 1994. What do you mean, 'Hans Segers'? Everton are back in business! This is why Romelu Lukaku is a £30m striker. He makes things happen. Back to goal, ball to feet, he turns, wrestles a man off the ball, moves the ball on to his left foot and then slides a perfect pass through toArouna Kone. He's just onside, takes his time, lots of it, and fires past Boaz Myhill from seven yards out. Away end goes nuts as the striker reveals a happy birthday message on hi T-shirt. What a tackle! It looked for all the world to be a chance for Saido Berahino but Brendan Galloway made up some serious turf to fly in and win it from him. Superb from the Everton man. Can they find more heroics at the other end to level this one up? That's a horrible dive and it's a form of cheating. Double change for Everton as off come Ty Browning and Steven Naismith, on come Darron Gibson and Arouna Kone. In the stands Gordon Strachan shakes hands with Martin O'Neill and Roy Keane. Big night out there. ...but it's a horrible dive from James McCarthy and he's booked for his trouble. Craig Gardner was nowhere near him! West Brom bring off big-money man Salomon Rondon and on comes midfielder Craig Gardner. Foot like a traction engine. That should see Saido Berahino pushed up top. Mark Sampson will be happy. 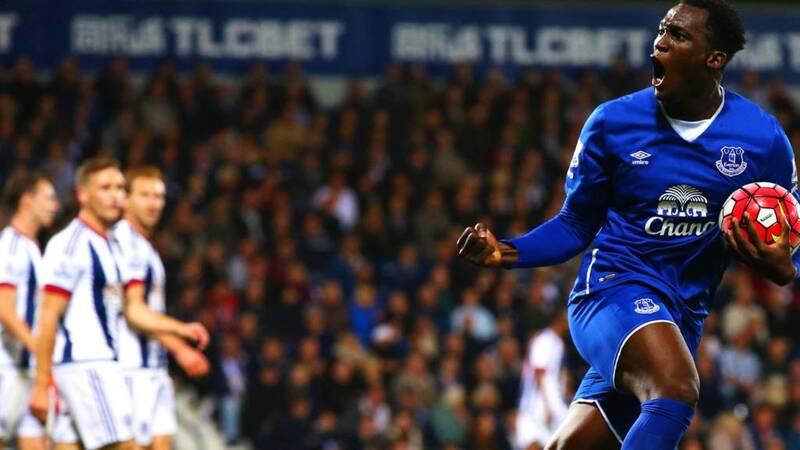 That's now 12 goals at the Hawthorns for Romelu Lukaku, only at Goodison Park (15) has he scored more in his career. Lest we forget - he is somehow still only 22! Albion now keeping the ball well, as Gareth Barry can't do that for Everton. Not a vintage night for Barry. They are taking an age over this free-kick - as Steven Naismith is booked for disrupting the wall - and Ross Barkley then hits the wall. West Brom try and slow the game down, they were in danger of being swamped in midfield. Saido Berahino collects a nice pass and shoots at Tim Howard - James Morrison was in on goal if he could have found him. Romelu Lukaku is almost clean through on goal but Chris Brunt wraps a size nine around it and clears. He berates a team-mate for an unseen misdemeanor. More goals in this, it's ragged. Well, in the words of Ron Burgundy, that escalated quickly. Gerard Deulofeu is now lazering in crosses from the right for fun. Another pearler in early, Romelu Lukaku flicks it on and Brendan Galloway can't gather it in beyond the far post. The game has improved a hundred fold. Demand it! Everton back in it instantly! Gerard Deulofeu whips in an early cross, Beckham-like. He didn't try and beat his man - just whipped it around the full-back. Romelu Lukaku gets up above James Chester and thumps the header home. He's done nothing - but he's scored. Where was the marking?! Everton's defence are AWOL once more as Craig Dawson shakes off a flimsy challenge from Ross Barkley to meet Chris Brunt's corner and thump in a header. More dreadful defending from Everton! They switch off at a corner, Jonny Evans is allowed to bring the ball down and clip to the back post, Darren Fletcher meets it with a header but puts it wide! An excellent metaphor there Joel. You should be doing my job. Everton work the ball patiently down the right but Ty Browning's cross is easy for Boaz Myhill to scoop up. A second striker on soon perhaps? West Brom then counter at pace - it's a better game, that's for sure. Everton just have to get their big players into the game. Romelu Lukaku has not been involved and now Ross Barkley gives the ball away cheaply down the left wing. Steve Claridge again mentions Barkley's weight. West Brom start well. Good break from midfield from James Morrison, gambling - and winning - on reaching a loose ball, his left-foot shot from 25 yards is well charged down and James McClean leans back and hammers the shot over the bar. Who would you rather have in your team - Saido Berahino or Romelu Lukaku? Everton's Lukaku has done lots of work outside the penalty area so far, coming to feet and looking to lay the ball off, but it is West Brom's Berahino who has been more of a threat in the penalty area. Predator. 'Come on!' is the message from Phil Jagielka as we get back under way at The Hawthorns. Five shots from Everton in the first half. Zero on target. News from the continent and Barcelona's Argentina international Javier Mascherano has been charged with two counts of defrauding the Spanish tax authorities of a total of more than 1.5 million euros (£1.109m). Mascherano is alleged to have sought to conceal earnings from his image rights by using companies set up in the United States and Portugal. A Spanish judge must rule on whether the Mascherano case should go to trial. If he does I imagine he can clear that with a cheque? I'd like to be a fly on the wall in the Everton dressing room as they discuss that opening goal. A comedy of errors. Tim Howard very nearly saved it to be honest. Quote Message: Whether or not either side deserve to be ahead can be debated. One moment of quality and that's the difference in the game. Whether or not either side deserve to be ahead can be debated. One moment of quality and that's the difference in the game. Tom Rostance says we have a game on our hands after that goal, but the opposite is probably true - West Brom will now look to protect and sit on that lead, it's going to be boring. Albion lead. A poor game has come to life with the only goal coming from a mistake. Everton need to take it up two or three levels if they are to fight back. Two minutes to be added on. Everton have been much more positive since falling behind. Gerard Deulofeu beats his man and puts in a great low cross which is hacked out. Suddenly there are goals in the air! Quote Message: Craig Dawson has probably been the most positive player in the West Brom side. It was terrible play from Gareth Barry. It was a lovely ball from Morrison. Berahino gets a little lucky. It's not a great finish but it hits the top of Howard's leg and makes its way to the goal. It was a good deflection for West Brom. Craig Dawson has probably been the most positive player in the West Brom side. It was terrible play from Gareth Barry. It was a lovely ball from Morrison. Berahino gets a little lucky. It's not a great finish but it hits the top of Howard's leg and makes its way to the goal. It was a good deflection for West Brom. That was a monumentally bad goal for Everton to concede. It came from their goalkeeper having the ball in his hands, 20 seconds later the ball was in the back of the net. Schoolboy. At the other end can Everton react? Yes. James McCarthy hits a low shot which Boaz Myhill has to push away. Out of nothing! Ramiro Funes Mori is robbed of the ball by Craig Dawson, Gareth Barry then makes a bad error, passing the ball straight to James Morrison in midfield. He plays in Saido Berahino and the striker just about squeezes a shot past Tom Howard. Howard got a big piece of it. But couldn't keep it out. Now we may have a game on our hands! Not a classic this one. Lack of drive, no width, sloppy passing. Everton's Steven Naismith has been the biggest offender on the distribution front, with only 63% of his passes reaching their intended target. The worst of any outfield player. Everton defender Ramiro Funes Mori ends a spell of play with a 30-yarder shanked high and wide. Symbolic. Fitting. Everton listen to Phil McNulty and switch the ball early out to Gerard Deulofeu - he beats Chris Brunt but then runs it clean out of play. Can we play 35 minutes this half? Blow up ref. Been singing this to myself for the last 10 minutes. Any other R Kelly songs worked into terrace chants? Everton new boy Ramiro Funes Mori plays a blind backpass and Tim Howard has to scramble it clear. Darren Fletcher tries a killer pass of his own at the other end but his outside-of-the-foot bender is well cut out. Bit more zip and nip in the game though. At last. Quote Message: Absolutely the best chance of the game. Deulofeu played it early. Barkley had time to adjust and he should have put it away. He got a touch, but a poor one. Absolutely the best chance of the game. Deulofeu played it early. Barkley had time to adjust and he should have put it away. He got a touch, but a poor one. CHANCE! A great chance too as Everton slice West Brom open. The first bit of quality as Gerard Deulofeu whips it in fast and early from the right, the Albion defence are all over the shop and Ross Barkley is in on goal. A good connection and it's 1-0 but he slices his shot wide. Is that the change of gear we badly needed? Jonas Olson hobbles off, Steve Claridge tells me that's a groin injury. On comes £8m James Chester (EIGHT MILLION). Quote Message: There's no width in this game. There's nobody wide to have a go at someone. We've had a plethora of passes, but they're not going anywhere. Regarding decent quality football, there has been very little of it. There's no width in this game. There's nobody wide to have a go at someone. We've had a plethora of passes, but they're not going anywhere. Regarding decent quality football, there has been very little of it. I can't bring you any chances but I can tell you that Gareth Barry has played 220 more Premier League games than WBA have. A dreadful 24 minutes of football. That's harsh - a very boring 24 minutes of football. Corner to Everton! Send the big guns up. Chance maybe? Nope. Quote Message: I don't think we're going to get a lot of change from either side. The way they're playing they seem more concerned about not losing than winning. I don't think we're going to get a lot of change from either side. The way they're playing they seem more concerned about not losing than winning. Jonny Evans gets away with a miskick as Romelu Lukaku doesn't anticipate it - he would have been in on goal there. Good news if you're sat in the stand where the TV cameras are positioned - you've got a great view so far, with all the play on the Everton left/West Brom right. If you're on the other side, WAKE UP! You might not have noticed but there is actually a game on. Quote Message: Everton's Ross Barkley looks a bit chunky. He's played a bit like that tonight. Everton's Ross Barkley looks a bit chunky. He's played a bit like that tonight. We've parked the loan signings debate now the game is on, but in lieu of any action I'm just going to mention one more. Someone has tweeted in Jari Litmanen for his spell at Liverpool. What a player. An artist. When Gary Neville and Jamie Carragher are throwing around words like 'tight' and 'cagey' an hour before kick-off, you should have concerns. Is this a 'tactical chess match' or is it just dull? The sides are cancelling each other out. Quote Message: Jonny Evans needed to leave Manchester United. He's now part of something at West Brom. He's not a peripheral player and I think he'll benefit from that. Jonny Evans needed to leave Manchester United. He's now part of something at West Brom. He's not a peripheral player and I think he'll benefit from that. I've just realised that with Everton playing makeshift full-backs, we have no regular full-backs on the field. West Brom, and Tony Pulis, don't do full-backs - TP will be keeping this one on DVD. James Morrison has a shot from 22 yards but it's right at Tim Howard. Easy save. BBC Radio 5 live at the Hawthorns. Quote Message: Both sides are playing with one up front so neither are allowing each other to play through the centre. Also you don't want four defenders occupying one up front, so you have to decide when you want the full-backs to push on. Both sides are playing with one up front so neither are allowing each other to play through the centre. Also you don't want four defenders occupying one up front, so you have to decide when you want the full-backs to push on. Ah, Darren Fletcher shanks it out of play. Come on. James Morrison and Saido Berahino link up neatly from a short corner on the right, but Berahino's chip into the middle is an easy claim for Tim Howard. West Brom happy to let Everton have the ball in their own half before pressing from halfway. Everton have started with Ty Browning at right-back, with Ramiro Funes Mori at centre-back and Brendan Galloway at left-back. Makeshift stuff. Gareth Barry is keeping things ticking over in the early stages for the visitors though. A cheery handshake and a hug from Roberto Martinez and Tony Pulis - chalk and cheese in managerial approach and fashion approach too. One club shop, one club class. It must be autumn - Martinez has fired up the body warmer. And we are off! The players are packed into the tunnel at the Hawthorns, Ross Barkley and Saido Berahino the best of mates it seems. West Brom: Myhill, Dawson, Olsson, Evans, Brunt, Fletcher, Yacob, Morrison, McClean, Rondon, Berahino. Subs: Chester, Gardner, Anichebe, Lambert, McManaman, Lindegaard, Gnabry. Everton: Howard, Browning, Funes Mori, Jagielka, Galloway, McCarthy, Barry, Deulofeu, Barkley, Naismith, Lukaku. Subs: Robles, Gibson, McGeady, Oviedo, Kone, Lennon, Osman. I make it that 23 out of the 36 players on show tonight at The Hawthorns are Brits. Much more relevant to me than watching the likes of Chelsea and Man City. Just 10 minutes now until kick-off at a picture-esque Hawthorns. The pundits on TV and radio are both expecting a cagey first 45 minutes. We want goals! Get after it. A nice early goal please. Since Tony Pulis took charge of his first WBA game on 10 January 2015, West Brom have kept more clean sheets in the Premier League than any other side (14). “I really had a good pre-season at West Brom and I was looking forward to the season but I guess that Tony Pulis had to sign some players and I’ve been unlucky that I’m not one of the players he wanted to keep," Ideye said. We've played Chelsea, Man City and Southampton at home. The home games have been really difficult. We've picked up most points away from home. We have to be resilient and hopefully move the ball as quick as we did against Villa. Gaz Habs: Lee Hendrie at Stoke, he started the belief we could do better that has never stopped since. Who knew Lee Hendrie was the catalyst to Bojan?Image caption: Who knew Lee Hendrie was the catalyst to Bojan? Gareth Barry has never lost a game against West Brom, winning 10 matches and drawing six, with his three clubs, all in the Premier League. Everton manager Roberto Martinez: "Ramiro Funes Mori has been impressive so far in the way he has adapted to the Premier League. "Clearly he needs to adapt to the tempo and the physicality. West Brom are really, really well organised." Tonight's fixture has come too soon for any West Brom or Everton men to force their way into Garth's team of the week - but what do you make of his selection this week? Plenty of football tonight on 5 live sport. Tune in now for the Monday Night Club as Mark Chapman and guests discuss the weekend's football and look forward to the action from The Hawthorns, and then enjoy full commentary of the game itself from Ian Dennis and Steve Claridge from 20:00 BST. Listen on the radio, online, or in this page. Just press play. Think you know your football? Test your expertise by playing our Predictor game and seeing if you can beat our resident expert. And do we suspect a touch of sarcasm in this one? West Brom's rivals Wolves are in the news tonight as owner Steve Morgan has placed the Championship club up for sale after eight years in charge. Liverpool-born Morgan, 62, who also built the Redrow building empire, will step down from the board with immediate effect. Chief executive Jez Moxey will manage the club's day-to-day business affairs. A club statement said: "Steve's ongoing commitment and financial support to Wolves will continue until a new owner can be found." Trouble ahead? Or a much-needed change? Nathaniel Chalobah at Watford. Just one of the few loanees we had! West Brom boss Tony Pulis admitted this week that he was surprised that John Stones and Saido Berahino are still at Everton and West Brom. “I just think the value of people and what’s going on has changed," he said. “In my opinion the transfer fees 10 years ago were ridiculous so don’t even ask me what I think of them now. “It’s crazy, but that’s the game. “We’re in a game flush with money and money is going to move around. I'm going to say...no, Ted. Saw Ross Barkley on loan at Sheffield Wednesday. Obviously a notch above the Championship. Best player on the pitch every game that month. Could we have him back? Where next for Steve Evans?Image caption: Where next for Steve Evans? The looming October international break tends to trigger a few moves in the managerial front - and there have been changes in the Championship today. Steve Evans - he of the Wembley touchline run - has left his position at Rotherham after three years, while Brentford's experiment with Marinus Dijkhuizen is over after just eight games. It means that Lee Carsley - former Everton midfielder - is now a Championship manager. Keep track with all of the managerial ins and outs here. Will Lee Carsley succeed where so many fail?Image caption: Will Lee Carsley succeed where so many fail? A loan signing is often a roll of the dice - some come off, some fail dismally. But sometimes these lodgers, these temporary visitors can strike gold. Take Romelu Lukaku for example. The striker scored 17 Premier League goals for West Brom during his stay from Chelsea, and followed up with 15 more for Everton while still on loan. Has your club done better though? Who is the best - or worst - loan signing you've ever had? Someone get you up? Keep you up? Win a cup final? Get in touch at #bbcfootball or pop on to the Match of the Day Facebook page You can also text us on 81111 in the UK only - don't forget to say who you are and where you are texting from. Quote Message: The league is nothing outstanding yet. Man City were 1-2 at the bookmakers, now they are odds against. It’s unpredictable and inconsistent. At times it’s not very good. I question the quality. Europe says it's very average. But it is exciting. The league is nothing outstanding yet. Man City were 1-2 at the bookmakers, now they are odds against. It’s unpredictable and inconsistent. At times it’s not very good. I question the quality. Europe says it's very average. But it is exciting. Which uncapped player deserves an England call-up? Following Jack Grealish's decision to declare himself eligible for England, we want to know which uncapped player is most deserving of selection by manager Roy Hodgson. The national team play Estonia and Lithuania in the next fortnight and, having already qualified for Euro 2016, Hodgson has a chance to experiment. So who should get the call? You can vote now at the top of this page. The vote will close at 22:00 BST and terms and conditions can be found here. Should Grealish have continued to represent the Republic of Ireland?Image caption: Should Grealish have continued to represent the Republic of Ireland? Some news you may have missed from this afternoon - Aston Villa midfielder Jack Grealish has opted to play for England rather than the Republic of Ireland. The 20-year-old played for the Republic at Under-21s level but turned down a call-up to the senior squad for a friendly against England in June. Birmingham-born Grealish qualifies for the Republic through his grandparents. "It was not an easy decision as Ireland has a special place with me through my family," he said. "But I have decided to represent the country of my birth." Will he feature in Roy Hodgson's plans? If you're wondering where West Brom and England goalkeeper Ben Foster is - his return from a knee injury has been delayed until December. The 32-year-old had cruciate ligament surgery in March and was expected to be back by October. "It'll be Christmas time I think," said Albion boss Tony Pulis. "We've got to make sure we're careful. "He had a little setback which pushed him back a little bit. He's up and running again now so fingers crossed he'll be ready to go before Christmas." "I witnessed West Brom's win at Villa Park last weekend and naturally Saido Berahino grabbed the headlines. "However, it was Jonny Evans who caught my eye. He marshalled the defence and showed leadership qualities in a resilient display. "A combination of misfortune and lack of discipline were two major reasons why Evans only made 17 appearances for Manchester United last season. "The Northern Ireland international will benefit from regular first-team football and will thrive under Tony Pulis. "Both sides boast excellent defensive records in the league which suggests a tight game is in prospect, and after three draws in their last four meetings, I wouldn't be surprised to see another." Everton make five changes from the side which beat Reading last week in the League Cup. With no John Stones, Leighton Baines or Seamus Coleman, it's a makeshift back four. Another chance for Brendan Galloway at left-back, while Ty Browning gets a game - we think at right-back. Like Galloway, he's a centre-half by trade though. West Brom make nine changes from the side which lost at Norwich in the League Cup last week. One man missing at the back is Gareth McAuley, with boss Tony Pulis revealing that the Northern Ireland international has picked up a slight injury. Steven Naismith makes his 100th Premier League appearance tonight. He was nearly allowed to leave the club during the summer but Everton will be glad they kept hold of him. The former Rangers manscored a hat-trick against Chelseajust a few weeks ago - and remains a cracking squad player. And there's the peril of preparing an intro - John Stones is NOT in the Everton squad tonight. News of any injury as soon as we have it. Does no now mean no after all? So it turns out that you CAN keep hold of your best players, after all. Your number one asset was about to head off, boots in hand. West Brom resisted a number of bids from Tottenham for forward Saido Berahino, including on deadline day. Saido momentarily spat his dummy out and toyed with the idea of going on strike. He thought it through - and scored the winner at Villa Park last week. Everton must have thought long and hard about a bid of over £30m for defender John Stones - but told Chelsea 'thanks, but no thanks'. Stones stayed and has played every game this season. Tonight the two meet up as we wrap up a goal-filled weekend in the Premier League.